Disclosure: This is not a sponsored post. I was sent supplies to facilitate making my own Dream Jar. All words and opinions expressed are 100% my own. The friendliest giant is coming to Blu Ray and Digital HD tomorrow. 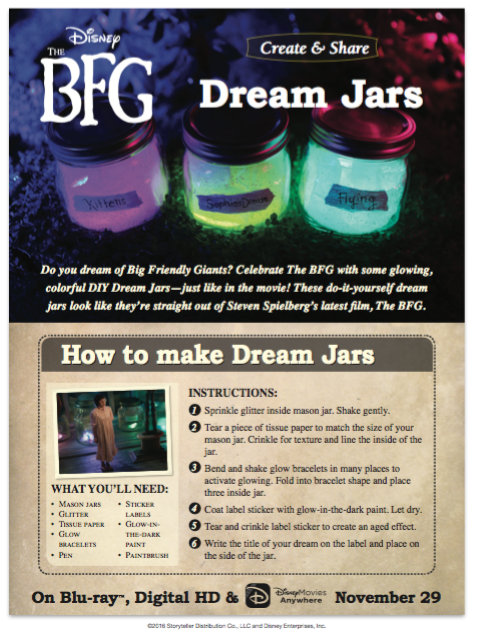 In honor of The BFG we made a dream jar, and you can make one to. A fun craft that can be made with your little ones and they can hold onto while they watch The BFG at home. These materials can be found at your local craft store or Michaels and all for a reasonable price. You can alternate the sticker labels with tissue paper. We didn't have any at hand so we just sticked our tissue paper with the glow in the dark paint. Valentina was very excited to make her own dream jar and couldn't wait to start, especially when she saw that glitter was involved. I can't blame her, glitter is the best. This is a fun and easy project that also requires very little clean up. Valentina loves Ice Cream therefor her dreams consist of Ice Cream. She loved her dream jar and having it next to her bedside. Just look at those fun colors. We can't wait to make more dream jars. Make sure to grab a copy of The BFG and get ready to travel in the world of giants. Mark Rylance as the Big Friendly Giant; newcomer Ruby Barnhill as Sophie, the orphan who befriends him and is swept into a world of rampaging giants; Penelope Wilton as The Queen; Jemaine Clement as Fleshlumpeater, the most fearsome giant from Giant Country; Rebecca Hall as Mary, The Queen’s handmaid; Rafe Spall as Mr. Tibbs, The Queen’s butler; and Bill Hader as Bloodbottler, another unruly giant from Giant Country. Now for some fun news. One lucky C'est La Vie reader will win their own Digital HD copy of The BFG. 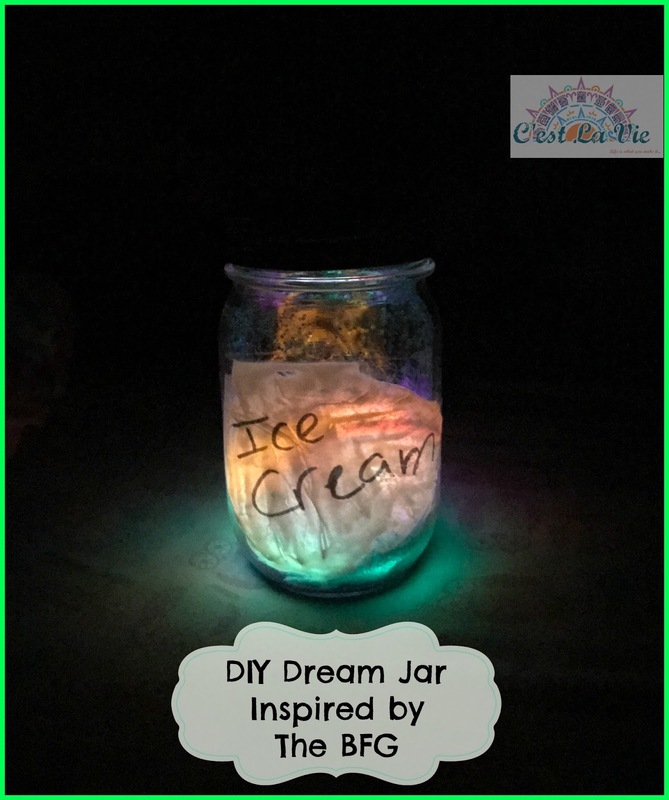 what would your dream jar be? 1 comment on "DIY Dream Jar Inspired by The BFG"
Dream jar would be to travel as much as possible with my girls!